Image courtesy of Good, with a little tweaking by me. 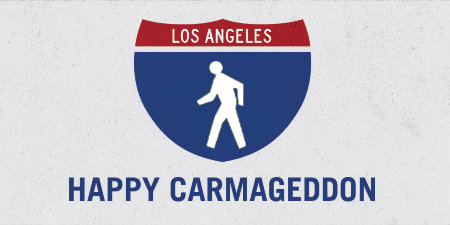 We'll know in a few days if it's truly the disaster the media is proclaiming it will be, or the disaster that never was, but either way this weekend's shutdown of the 405 is a great excuse to ditch your car and check out your neighborhood on foot. If you live in the Valley near me, you can join in Saturday's Carmageddon Walk to Mulholland Bridge, or take an hour to do a walk audit of your neighborhood﻿ and then find out what you can do to fix the problems you discover. Enjoy!